ITALY: Renewable energy was the main driver behind Enel's growth in operating profit, the power firm stated, and was its largest recipient of investment in the first nine months of the year. The Italian company’s reported earnings before interest, taxation, depreciation and amortisation (Ebitda) rose 6% year-on-year to €12.1 billion between 1 January and 30 September. It stated that this increase was "mainly driven by renewables", and that – along with networks – clean energy sources contributed €670 million of earnings in this period. Enel increased its capital expenditure on renewables by 32% year-on-year, and with an investment of €2.65 billion, clean energy received more than any other business line as it did in 2017. The power company installed 3.3GW of new renewable energy capacity in the last 12 months, it stated. 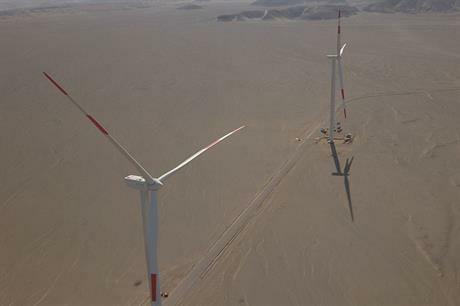 This total includes 613MW of new wind power capacity commissioned by its subsidiary Enel Green Power in the first nine months of 2018, including a 132MW project in Peru – the country’s largest wind farm. It also added hydro (62MW) geothermal (1MW) and ‘solar and others’ (1,112MW), but no new nuclear, coal, combined cycle gas turbines (CCGT), or oil and gas during this period. Enel’s wind fleet reached 7,438MW at the end of the third quarter: 8.75% of its 84,932MW total capacity. Hydro, coal, CCGT and oil and gas all had larger shares of this total. Wind also trailed these power sources in output between January and September, with its 16,345GWh accounting for 8.7% of Enel’s 187,764GWh total generation. The Italian power company had 3,279MW of wind projects under construction (1,773MW) or ready to build (1,506MW) at end of Q3, more than any other power source. It arranged financing for five long-delayed South African wind farms with a combined capacity of 700MW in August, and acquired a five-project, 132MW wind portfolio in Spain in February. Enel also announced plans in April for 400MW of capacity in Russia in addition to the 291MW it secured in a tender last June.